This is an amazing facility which we regularly visit. We love this park. We love it so much we held our sons’ joint birthday party there in October 2013. Many of our friends are familiar with this place but those who weren’t sung its praises on party day! 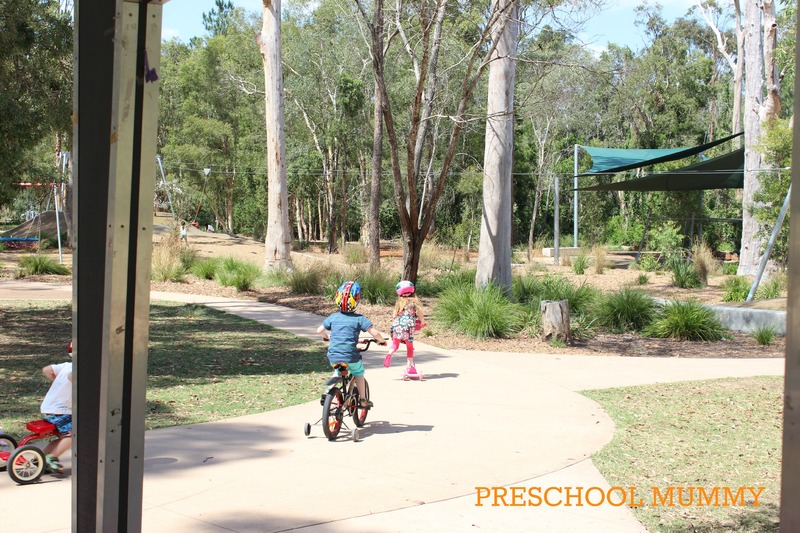 I want to share with you why we think this park is so awesome and why you should make a visit there with your preschoolers soon. Calamvale District Park is at Formby Street, Calamvale, however we like to use the Ormskirk Street entry because it’s closer for little legs to walk to the playground area, has off-street parking (including disabled parking), and is close to the toilet facilities (of utmost importance when out and about with toilet-training-toddlers). Here’s a little map to help. Okay, so getting to the point (being this park’s awesomeness): The star of the park is the tree-top skywalk. As the saying goes, “what goes up, must come down”, and there are only two (challenging) ways to reach the top – via an enclosed ladder, or via the huge spiderweb structure. 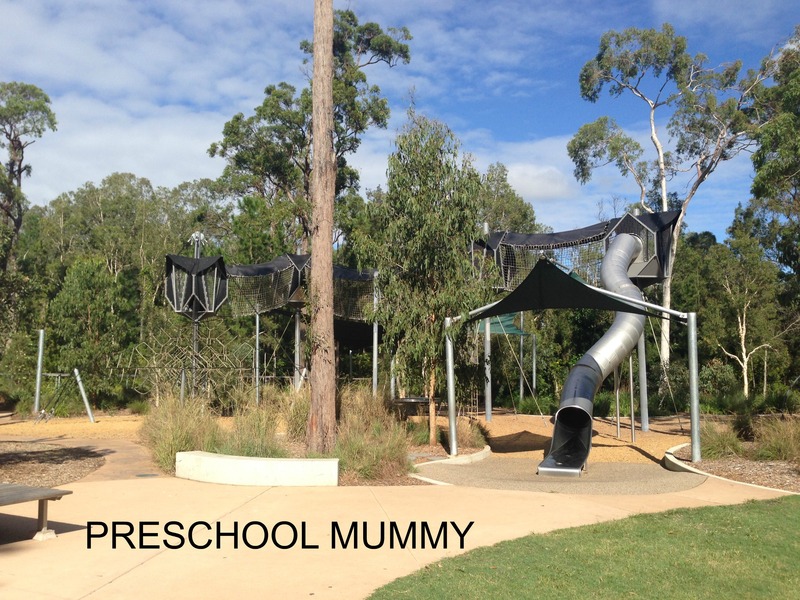 Getting down is totally fun – trust me, I’ve tried out the huge metal twisty slide myself, as part of an…ahem…toddler treetop rescue mission. 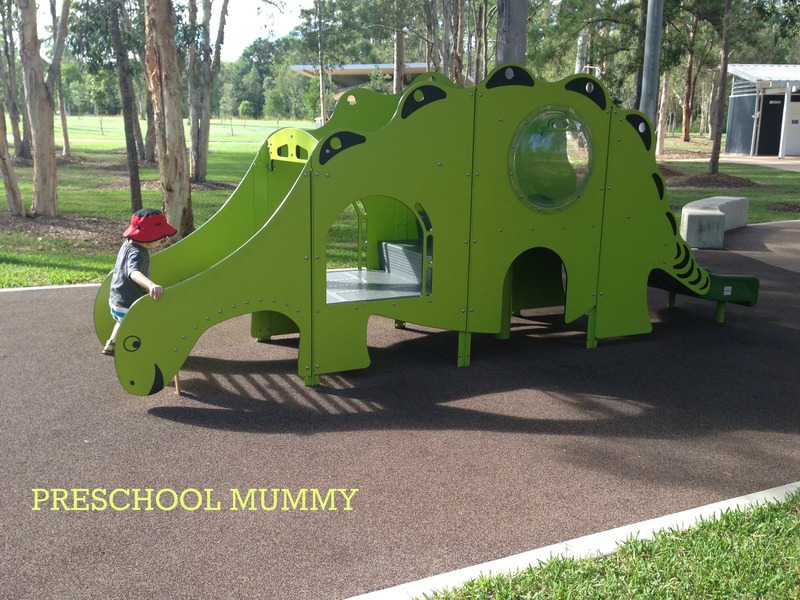 My boys were also rather chuffed this morning to discover the park’s newest addition – the lime green stegosaurus-shaped climbing frame with mini-slides. On weekends the park is a buzzing hub of fun for families from near and far. We like to visit on week days for a quieter experience and to ensure the kids have a turn at a variety of activities. It’s a great morning out if you’re a South side local, and definitely worth the drive over if you’re from the North. Previous Post Up-cycled change table craft trolley.